Expert Masonry Tuckpointing Work – Guaranteed! As durable as masonry is, when it starts to develop cracks and holes, repairs are a must. Oftentimes, mortar is the first to deteriorate, leaving the chimney looking worn and dated, and compromising the overall structural integrity and safety of the chimney. But no matter how minor or major your mortar repair needs are, Copper Top can help. Our team of licensed and insured, expertly trained chimney professionals can make any needed repairs and restore your masonry chimney both structurally and aesthetically. We tuckpoint and spot point all missing mortar that is 1/16th of an inch or greater using a clear mortar epoxy or mortar that is color matched to the existing mortar of your chimney system. We start by using specialized tools to carefully grind out the damaged mortar, without doing damage to surrounding brick or mortar. Once we’ve removed all the deteriorating mortar, we clean the area and begin packing the joints using either clear mortar epoxy or mortar that we’ve carefully color matched to your chimney’s mortar. We’re committed to producing high-quality, beautiful, long-lasting tuckpointing results, and take great pride in any masonry work we perform. In our minds, there’s no room for error or laziness, which is why we pay attention to every little detail and make sure all of our work is clean and effective. The strength of your mortar joints will determine the strength of your chimney. If the mortar packed into these joints does not match the surrounding mortar in terms of structural strength, color, and consistency, you’ll be left with a chimney that looks messy and puts unnecessary stress on certain areas. Don’t let just anyone perform your masonry tuckpointing work – trust the professionals with over 300 A reviews on Angie’s List. Once we’ve finished tuckpointing your chimney, we can even waterproof it to prevent moisture damage in the future. 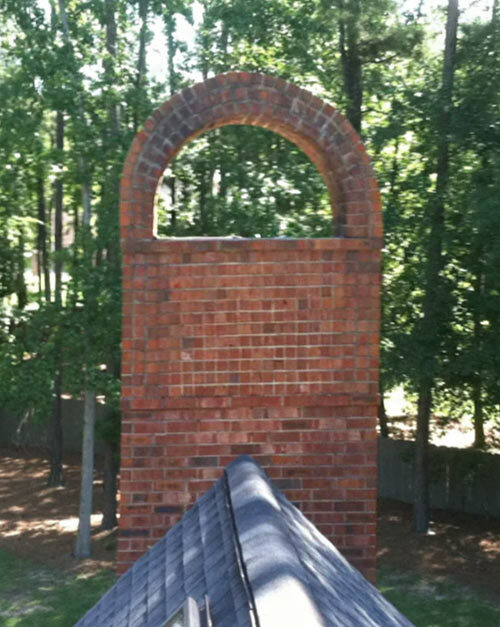 Our technicians use ChimneySaver, the industry’s leading masonry water repellent, to keep the chimneys of our neighbors in Atlanta, Roswell, Chattanooga, and the surrounding areas looking great and standing strong. Whether you’re looking to learn more about our masonry waterproofing services or you’re ready to schedule your masonry repairs, call us at 770-944-1200. We’re here to help! Click here to fill out our online appointment request form! There’s good news if you need masonry chimney rebuilding or restoration: we have years of experience with these professional chimney repairs, so give us a call.